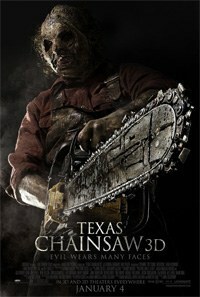 With Texas Chainsaw 3D's release, the question of what the "True Story" (if any) really was, is catching the buzz, again. For as long as I've been reviewing and writing about movies there has always been one subject that is the surefire method for evoking angry fan response. How dare I claim that the Texas Chainsaw Massacre wasn't real? What am I, stupid? Don't I know that someone's cousin twice removed knew a guy who knew the people who bought the house where all of those murders, like, actually happened? Don't I realize that even if Tobe Hooper did make up the whole “Leatherface” story, that the exact same thing he filmed really did also happen in real life just by chance? Haven't I read that this is all a matter of public record that somebody's brother's best friend's uncle's neighbor knew a guy who knew a guy who had a clipping from the newspaper about it? How could I not know this is real? No, I don't know that... and neither does anyone else. Because The Texas Chainsaw Massacre (or, as it was originally known, The Texas Chain Saw Massacre) never happened. Not outside of a series of movies, anyway. Those movies, connected or otherwise, go a lot farther and deeper and span a lot more time than most fans (or haters) probably realize. Before we delve into the myriad linked films in this quasi-saga, let's begin with a little bit of reality. First of all, yes, there really was a man named “Ed Gein” (that last name rhymes with “mean”, not “dine”) who served as the very loose inspiration for one character in Tobe Hooper and Kim Henkel's original 1974 fright fest The Texas Chain Saw [sic] Massacre. He was a real-life killer whose escapades are legendary, even to the point that he was whispered about in the small town Louisiana schools I went to (he was known as "that mean old butcher"). So isn't that proof in itself that “it's all real”? No. Although Gein is sometimes referred to as a “serial killer”, he was only ever proven to have killed two people (his crimes were more of the “grave robbing” sort), there is absolutely no evidence whatsoever that Gein ever used a chainsaw in his crimes and there is no evidence whatsoever that Gein had ever set foot in the great state of Texas at any point in his long life. In short. No Texas, no chainsaw... no massacre. Another slice of reality is that Gein was arrested in 1957, 16 years before the purported events of the first film. Unlike Leatherface, Gein was a complete loner with no psychotic family to help him (everyone was already dead) and Gein lived his entire life (including the prison years) in Wisconsin. While I will grant that “The Texas Chain Saw Massacre” is a more interesting title than, say, “The Wisconsin Cemetery Vandalism Cheese Acre”, that hardly makes the story real. Still, Gein's really gross crimes had invaded the public consciousness enough to inspire books and movies about him. And The Texas Chain Saw Massacre was far from the first of these. Probably the first fictional story inspired by Gein was penned by a 40-year-old writer who lived less than one hour away from Gein at the time of his arrest. Two years later that novel was published and only one year after that, its first film adaptation was released and is still hailed today as one of the best films ever made. The author was Robert Bloch, the book was Psycho (1959) and the acclaimed film that it inspired is commonly referred to as “Alfred Hitchcock's Psycho” (1960), one of the prime examples of the horror art film. Thirteen years later, a much less artistic and successful film was released called Three on a Meathook (1973). While this ultra-low budget shocker does contain many of the elements that have become slasher film staples, Three on a Meathook is a curiosity for the exploitation fan, but isn't exactly an according-to-Hoyle classic. Fans would have to wait one more year for a truly scary and accurate Ed Gein flick to premiere. While Three on a Meathook and Deranged were in production, a young film student at The University of Texas at Austin named Tobe Hooper began formulating the ideas for his own horror film. It would be set in Texas (because that's where he lived) and would be filmed in a stark, realistic documentary style (because he happened to be a documentary filmmaker). He and his co-writer Kim Henkel based their graphically violent scenes on some particularly gruesome coverage from San Antonio TV stations (note that the film starts with a news broadcast and is guided by the deep, documentary-style narration of John Larroquette). Although Henkel and Hooper do credit Gein as an inspiration, Henkel cites murderer Elmer Wayne Henley as an additional source of ideas. Hooper's use of a chainsaw as the main weapon was inspired by a particularly long line in a hardware store while he contemplated ways to speed through the crowd. Wielding a chainsaw to cut through the crowd surely would have done the trick, but luckily Hooper kept this firmly in the realm of fiction and let his now-infamous “Sawyer” clan do the slaughtering in the first Texas Chain Saw Massacre. The post-Watergate, post-Vietnam War media fatigue caused a lot of disillusionment in Tobe Hooper, as it had in a great many Americans. In response to what he perceived as governmental lies and misinformation in the media, Hooper started his fictional story with the claim that this “film you are about to see is true”. And thus a legend was born. Initial reviews were mixed but the cultural impact was undeniable and in the subsequent re-analysis of the film, it has been regarded by many critics and film historians as nearing the quality of Psycho. It almost immediately began winning awards and inspiring other films. Everything from Halloween (1978) to The Blair Witch Project (1999) to The Evil Dead (1981) to even Alien (1979) has taken some inspiration from the film. Naturally, more films “based on Ed Gein” (to varying degrees) were soon on the menu. In the post-Halloween slasher boom, such films as Maniac, Don't Go in the House and Motel Hell (all from 1980) took very loose inspiration from the story of Ed Gein and the prior films that he accidentally inspired. In 1983 the slasher boom even prompted Universal Studios to revisit their own Gein-inspired property with Anthony Perkins returning to his own (loosely) Ed Gein-based role of Norman Bates in Psycho II. Tobe Hooper himself attempted to replicate his successes with similarly themed fright flicks Eaten Alive (1977) and The Funhouse (1981), both of which are so similar to The Texas Chain Saw Massacre that they give the impression of having been written with the assistance of a “Mad Libs” book. 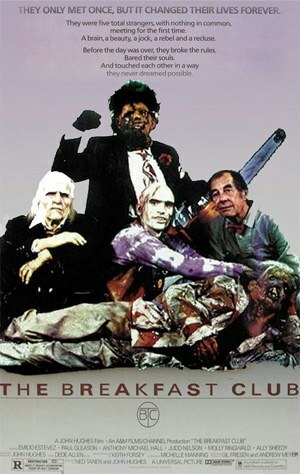 With everyone else making money from their Gein horrors, what was Tobe Hooper to do, but follow suit all his own with The Texas Chainsaw Massacre 2 (1986)? Note the spelling of “Chainsaw” had evolved. Reportedly Hooper was unaware that “Chain Saw' was not usually spelled as two words when he made the first movie. 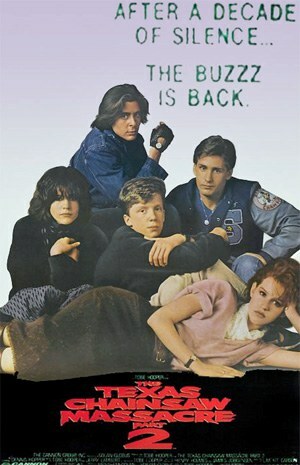 If its humorous poster (a direct spoof of the prior year's The Breakfast Club poster) didn't clue one in to the fact that this sequel was not the serious and disturbing horror film that its predecessor was, star Dennis Hopper's over-the-top delivery surely set the silly pace with careless ease. While considerably more violent and bloody than the first film (which was much more suggestive in its gore), “Part 2” was firmly rooted in the “dark comedy” subgenre of slasher films. The sequel went unrated by the MPAA and was banned in Australia for 20 years. Still, any claim to seriousness goes out the window when Dennis Hopper's character “Lefty” engages in a lightsaber-style duel against Leatherface, fencing with chainsaws that Lefty keeps in his hip holsters like Wild, Wild West revolvers. This is, to date, the most serious sequel in the saga. Not to be outdone, the Psycho series followed suit that same year with Psycho III and the barely Bates related TV movie Bates Motel (1987). The two sagas with the similar inspirations bowed together again with Psycho IV: The Beginning and Leatherface: Texas Chainsaw Massacre III (both 1990). It was the next year that the most surprising turn in these filmic legends would take place, because in 1991 a movie based in small part on the private aspirations of Ed Gein swept the Academy Awards. It wasn't the first time the charming villain Hannibal “The Cannibal” Lecter had been adapted for the big screen, but The Silence of the Lambs (1991) did mark the first (and last) appearance of that terrifying sociopath Jame “Buffalo Bill” Gumb (Ted Levine). Author Thomas Harris took inspiration from six different “serial killers” in the creation of Buffalo Bill, but his most notable attribute (that sick desire to make “a woman suit” for himself) was taken directly from the crimes of Ed Gein. Psycho had been nominated for four Academy Awards. The Silence of the Lambs, however, swept the “Big Five” Oscars, taking home Best Picture, Best Director (Jonathan Demme), Best Actor (Anthony Hopkins), Best Actress (Jodie Foster) and Best Adapted Screenplay (Ted Tally). If films of this ilk had reached their creative pinnacle in 1991, they surely reached their creative nadir in 1994 with the ridiculous farce The Return of the Texas Chainsaw Massacre (AKA: Texas Chainsaw Massacre: The Next Generation). This terrible film marked the return of Kim Henkel to the franchise (this time as director and writer) and walked a strange line between remake, reboot and sequel. The “Sawyer” family has now been renamed “Slaughter” and Leatherface (now in full-on cross-dressing mode) uses his chainsaw only on inanimate objects. Hardly a “Slaughter” or a “Massacre”. The series was no stranger to pre-stardom actors (the third film starred a young Viggo Mortensen), but this fourth film (which was almost completely buried on its initial release) accidentally hit the jackpot. The Return of the Texas Chainsaw Massacre featured two young, up and coming Texan actors in the lead roles who were not at all name-stars upon the film's wrapping and film-festival release. However, shortly after this, star Renée Zellweger had a huge hit with Jerry Maguire (1996) and male lead Matthew McConaughey got his big break with A Time to Kill (also 1996). Thus, Columbia Pictures resurrected the film for a theatrical release. Lucky for McConaughey, his agent put serious pressure on the studio not to release the film for fear of hurting his now A-List career. In the end, while McConaughey and Zellweger's names are now above the title, and their faces are central to the promotional material, the theatrical release of this film was limited to 20 US cities. The rest of the country didn't miss much. The film's reviews were worse than those of TV's Manimal. The year of 1998 marked the shot-for-shot remake of Psycho as directed by Gus Van Sant. Although reviewed much more harshly than its 1960 inspiration, and has been referred to as a “Bomb”, “Pointless”, “Plagiarism” and “an Insult”, it was still much more generously reviewed than The Return of the Texas Chainsaw Massacre. In the Light of the Moon (2000) was released in the US as, simply, “Ed Gein” and purported to tell the true story of Gein in the more starkly realistic manner of Henry: Portrait of a Serial Killer. Much of its potential was killed by its meager budget, but it does have its cult following. One film that didn't lack budget was the 2003 remake known again as The Texas Chainsaw Massacre. Produced by Michael Bay's saga-assassinating remake machine and money vacuum cleaner Platinum Dunes productions, the remake received an overwhelmingly negative consensus from film critics but brought in over $107 million at the box office against a budget of less than $10 million. This success led to a string of (mostly awful) remakes of classic horror films (most of which were also produced by Bay's Platinum Dunes). The film also spawned a prequel in 2006's The Texas Chainsaw Massacre: The Beginning (which received even worse reviews than the 2003 turkey). This film attempts to tell the origins of the cannibalistic “Hewitt” family (note, neither “Sawyer”, nor “Slaughter” anymore) and has about as much to do with the dubious inspiration of Ed Gein as it does with Season Three of MacGyver. Probably inspired by the continuing success of the prequel, something of a cash-in film was made in 2007, known as Ed Gein: The Butcher of Plainfield. Like In the Light of the Moon, Ed Gein purports to be the true story of the man who inspired all of these characters but the Gein runs around in a very Leatherface-like mask and his two known murders have been amplified into an entire spree of kills. Most tellingly, the scrawny and meek Ed Gein is played in this film by the muscular stuntman Kane Hodder, best known for playing fictional serial killer Jason Voorhees in more films than any other single actor. Clearly this was much more a Leatherface slasher flick than an Ed Gein biopic. The year of 2013 marks the debut of a new Norman Bates-centric TV show called Bates Motel, which promises to tell the tale of how the innocent kid became such a... psycho... with a certain American Horror Story flare. Meanwhile, the first big Horror Movie release of 2013 is Texas Chainsaw 3D which completely ignores the continuity of the remake, its prequel and the 1994 Leatherfarce. Although the original Sawyer family and its lineage are back, along with original series stars Gunnar Hansen, Marilyn Burns and Bill Moseley, its reviews, thus far, are somewhere around the Platinum Dunes level. That's not a good thing, Leatherface. In short, far be it from Hollywood (or anyone else) to glorify a killer, living or dead. Looking at the fact that the films Ed Gein inspired are so far from his own repulsive (yet hardly spectacular) reality, it's easy to see that there is no glory to be seen here. As for the longest running series of films with a dubious connection to the psycho from cheeseland, The Texas Chainsaw Massacre saga, it bears about as much similarity to his life as I bear to the Oracle at Delphi. Once again, folks, while there was a man with the smallest connection to these events, there was never a “Texas Chainsaw Massacre”. The true story contains no Texas, no chainsaw and no massacre. Perhaps if Hooper had kept the working title of “Headcheese” and inverted that into “Cheese Head” it would have had more of a Wisconsin connection. Packers fans would likely line up in droves. So until Michael Bay in his infinite lack of wisdom actually kicks his Platinum Dunes cronies into high gear for the production of the real deal Wisconsin Cemetery Vandalism Cheese Acre, I'll see you in the Next Reel.